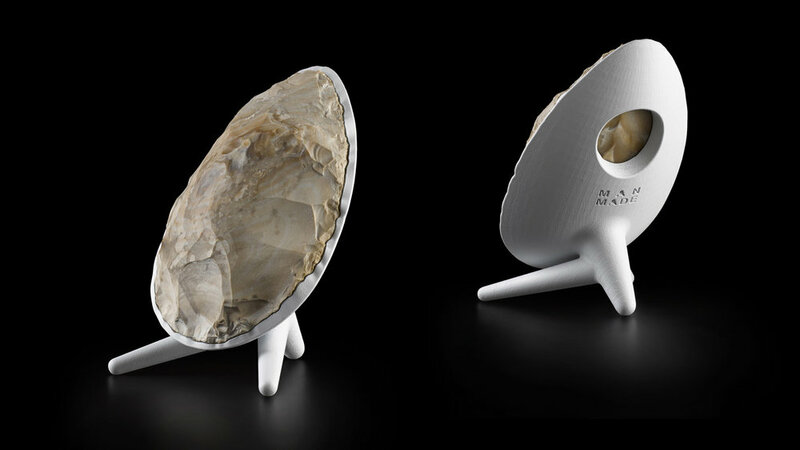 Designed to celebrate man’s incredible achievements, the Man Made series consists of nine stone-age tools which have been given a contemporary 3D printing upgrade. Among the stone-age community dating back to the Paleolithic Period some 700,000 years ago, hand axes were a sign of success and extraordinary skill. The series of hand-axes includes flint stones formed using the primeval method of knapping – the art of striking flint with another stone to create a new form – which was considered to be a ‘cutting edge’ technique at the time. Putting a mirror to this stone-age practice, 3D printing was used to produce contemporary axe handles for the collection. 3D printing is, in a way, a modern day equivalent of knapping – immensely useful, cutting edge and giving new custom form to suit the need. By blending technologies from the farthest ends of human existence, Ganchrow and Drach were able to showcase how simple designs powered by clever thinking can translate into beautiful, functional and history changing objects.